Not Neato: Fern Lake Fire, Rocky Mountain National Park, Colorado, USA | KeaNeato! Screen shot from the Loveland (Colorado, USA) Reporter Herald with image of a smoldering Moraine Park. Meandering stream in Moraine Park, Rocky Mountain National Park, USA. 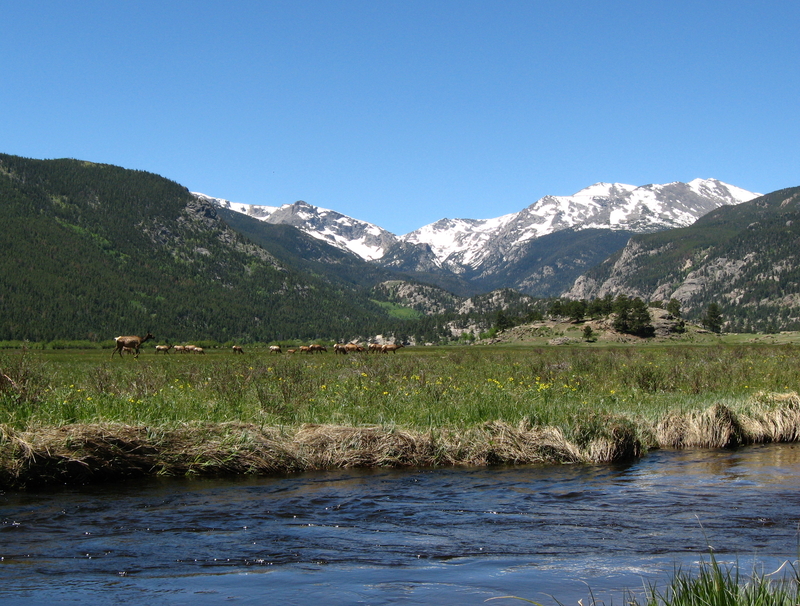 My favorite place in Rocky Mountain National Park, Colorado, USA, is the lovely Moraine Park meadow, with its meandering stream, butter & eggs flowers, and sweet grass. Because of a fire that started this summer but really kicked up again just a week or so ago, this meadow is now scorched. My favorite tree (see below) is probably gone. It will be a truly different place when I visit again. The tree in Moraine Park under which Bear and I picnicked on our first anniversary. The good news is that meadows are often revitalized after a fire. But this spring and summer will furnish little grazing area for the herds of female and juvenile elk that trek through here each year (see below). Elk graze in Moraine Park, Rocky Mountain National Park, Colorado, USA. The eastern slope of the Colorado Rockies and plains are experiencing a heartbreaking drought right now, with current snowpack levels at about 0% (thought there is a 40% chance of snow in Estes Park today). It’s December, and the thermometer on my deck showed that it was 74°F at lunchtime yesterday. The Boulder County Sheriff has enacted a fire ban this month because of the “tinder dry” conditions. This year, we truly could use a white Christmas — a very white, heavy, dump of snow this Winter Solstice that lasts through the new year. That’s my holiday wish. This entry was posted in NOT neato and tagged drought, Estes Park, fire, photography, snow. Bookmark the permalink.